What's the difference between the two major OS heavyweights? New MacBook Pro and MacBook Air aside, the big news from WWDC 2012 for Apple fanboys was the official unveiling of iOS 6. Set to launch in the autumn (maybe alongside the iPhone 5), the latest iOS update will be available for iPhone 3GS, 4, 4S, 2nd generation iPads and newer, and the 4th generation iPod touch. While iOS 5 brought us iMessage, iCloud, Twitter integration and a raft of new camera features, iOS 6 looks to have plenty of features to look forward to as well. But how does it fare against the latest Android OS, Ice Cream Sandwich? We've squared up the specs to see who comes out on top. From a design perspective, we can expect much of the same in terms of looks and the feel of interacting with iOS 6. So expect the Android-inspired notification bar pull down to stil be present, as well as folders and many of the new elements added in iOS 5. Android 4.0 is of course all about the homescreens and bringing a universal look and feel to Google-powered devices running the latest version of the mobile operating system. There's the lock screen that gives you quick access to your smartphone or tablet camera, re-sizeable widgets and shortcuts to drag onto the five homescreens, app folders, but this particular feature doesn't feel as well executed as it is in iOS 5. Having ditched Google Maps, Apple has teamed up with TomTom to create a native Map app where iOS 6 users can expect a 100 million business listings from around the world, turn-by-turn navigation and a 3D view over cities that 's a slick alternative to the revamped Google Earth currently available on Android. Google Maps has been ruling mobile navigation for some time and the search engine giant continues to refine the application to make it the ultimate mapping experience. It does most of what Apple claims its Map app will offer, but the question is whether Google will be able to match Apple in terms of design. Siri was first introduced with the iPhone 4S and as we mentioned in our review its ability to set reminders, make calls and have fun – like asking it the meaning of life was very innovative. Whether it was useful is another matter. iOS 6 seeks to add more functionality with the ability to launch apps and learn more about content such as sports and movies. 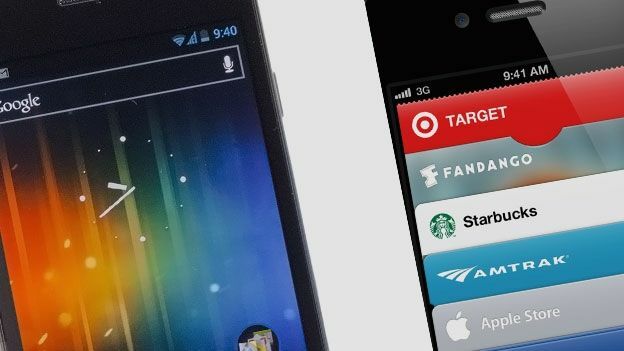 Exclusive to the Samsung Galaxy S3, S-Voice is Samsung's answer to Siri but lacks the wit and whimsy of the iPhone 4S voice assistant. It will let users command the device to make calls, open apps, play music, search the web, set alarms, find restaurants and much more. The iPad is set to be added to the Siri ranks this time around, while S-Voice remains exclusive to the Samsung Galaxy S3, and it's not clear whether it will officially be opened up to other Android smartphones or tablet devices. Apple has introduced the ability to sync bookmarks and tabs from a desktop to an iPhone or iPad as well as offering Apple smartphone and tablet users the ability to save websites and content for offline viewing. Android 4.0 already boasts the same functionality but crucially, is must be done through the Google Chrome browser. Essentially, there is very little between the browsing experiences and should deliver great ways to rummage around the internet. The Cupertino company may have ditched Google, but it is clearly getting cosy with Facebook in iOS 6 by delivering deeper integration of the social networking website. This includes the ability to post pictures from Safari, Maps and Photos. Additionally, you can now 'like' apps in the iTunes Store. Add the Twitter integration from iOS 5 which enabled users to tweet directly from Twitter-enabled apps, including Photos, Camera, Safari, YouTube and Maps with a single tap, and Apple has covered the bases. iOS 6 is not laden with the kind of camera features introduced with iOS 5 but it does see added functionality to Photo Stream where users can now share snaps across all devices and share photo streams with friends and comment on your favourite or least favourite pics. Also on the camera front, support for Facetime over 3G also means that like Android 4.0, you can video chat via over 3G and Wi-Fi connections. Android 4.0 brought a whole host of camera features including comprehensive editing features, the ability to take panoramic photos, built-in face detection and plenty of live video effects. The camera unlock feature also meant quick access to your snapper as well. Some of the camera features do however vary depending on Android 4.0-supporting devices. Following up from 'Find My iPhone', iOS 6 welcomes 'Lost Mode' to the security fold which enables users to send a phone number to their Apple smartphone and hope that the person who has got their hands on the phone can return the call and give it back. Android 4.0 security features include the ability to encrypt your phone, set up a SIM card lock, but it notably lacks a native feature similar to Find My iPhone. There is an app on Google Play called Find My Phone which can help track down your device. There's also Face Unlock mode which has faced some criticism over how secure the face recognition feature really is. if iOS users want to get a similar experience they can actually download FaceVault from the App Store. We've had plenty of time with Android Ice Cream Sandwich and there are clearly areas where it excels in comparison to Android 3.0 and the current version of iOS particularly in terms of multitasking, navigation and mapping, widgets, and social networking. Of course, iOS 6 will address many of those things and while we wait to have a play with iOS 6, it all sounds very promising particularly the smarter Siri and the native Map app which could deliver a great alternative to Google Maps. Stay tuned to T3.com where will have a comprehensive review of iOS 6 and the best new features. Impressed by the iOS 6 features? Let us know in the comments section below. Apple iOS 6 to remove password entry for free app downloads?